Top : Designers : Kerwin Naval Architects, Inc.
Full service design & engineering firm performing new construction design and refit engineering with production in mind. Established in 1997 in Ft. Lauderdale, we have provided engineering and design, expert witness testimony, damage surveys, and shipyard process design for hundreds of clients. We specialize in production motoryachts over 40' and custom motoryachts over 60', as well as small commercial vessel (under 400') work. Web Site Snapshot: If available, above is a snapshot of the Kerwin Naval Architects, Inc. web site at http://www.kerwinnavalarchitects.com as it appeared when this site was added to the directory or last verified. Please Note that Boat Design Net has no involvement with the above web site; all content and images depicted in the above thumbnail are the property and copyright of Kerwin Naval Architects, Inc. unless otherwise noted on that site. Description: Full service design & engineering firm performing new construction design and refit engineering with production in mind. Established in 1997 in Ft. Lauderdale, we have provided engineering and design, expert witness testimony, damage surveys, and shipyard process design for hundreds of clients. We specialize in production motoryachts over 40' and custom motoryachts over 60', as well as small commercial vessel (under 400') work. 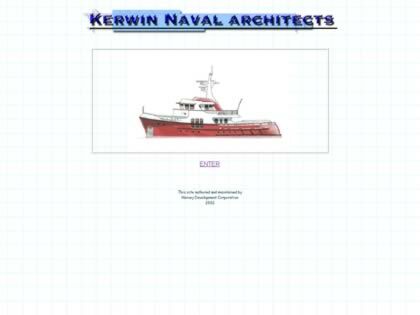 Visit Kerwin Naval Architects, Inc.